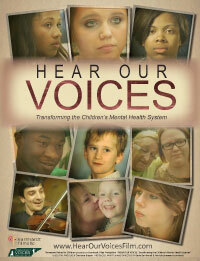 HEAR OUR VOICES follows the journey of children and young adults who fight to overcome their mental health challenges. Through them, we get a glimpse at both the flaws and the strengths of our children’s mental healthcare system. We learn that the youth’s mental diagnosis does not define them, nor is it their complete identity. A film by award-winning filmmakers David & Patricia Earnhardt in association with Tennessee Voices for Children, HEAR OUR VOICES makes the case that all children need access to affordable treatments and supports that will make a profound difference in their lives.